Who Course is For: Environmental Consultants, Fish and Game personnel, Biologists, Department of Water Resources personnel and other State and Federal employees who work on or around flowing water. This course is designed specifically for Environmental Consultants, Fish and Game personnel, Biologists, Department of Water Resources personnel and other State and Federal employees who work on or around flowing water. Emphasis is on safe and best practices, hazard recognition, prevention and self rescue, proper use of equipment and simple rescue techniques. 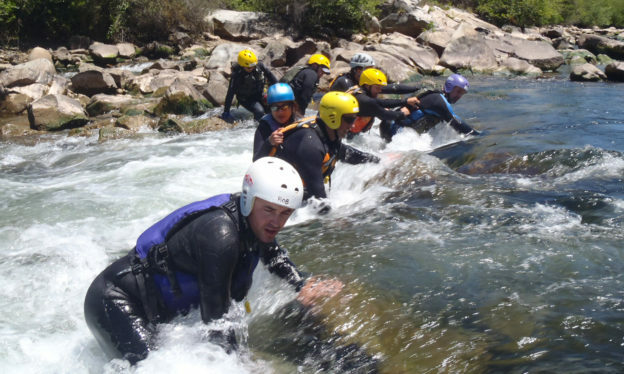 Students will benefit from this intensive, hands-on course and will learn to use techniques and simple equipment to access and perform river rescues. The emphasis is on speedy, low-tech, and improvised rescue techniques that are effective and require minimal equipment and involves boat and inflatable kayak safety and rescue when used by the Agency. These courses are usually taught as custom courses for specific Agencies or groups of people. River Guides, Private Boaters and Kayakers should take the ACA or the River Rescue Certification.